Originally known as Hose Company No.1 it was one of the first companies formed when the Department was reorganized from “Central Islip Hook & Ladder & Chemical Company 1” to the “Central Islip Fire Department”. Over the years the number of members in the company fluctuated but eventually settled on 25 members not including Senior Active members with 20 or more years of service. Before Captains ran the companies in the Central Islip Fire Department Foremen’s were in charge of the company and the members. The first “Forman” of the Hose Company was Thomas Cordingley in 1929, and the first “Captain” of the company was William Klinke Sr. in 1947. In 1947 with the rise in population due to the end of World War Two the members of the department decided it was time to expand the department and create a new engine company. It was then decided that Hose Company No.1 would be reorganized and Engine and Hose Company No. 3 was established. Charter members of the Engine and Hose Company Three were: John Brewer, Joseph Brewer, Rudolph Bruch, William Bothwell, Harold Cordingley, Michael Czerkas, Bernard Dean, James Grimes Sr., Robert Groth, Georg Howarth, Hooper Howarth, Albert Herr, Bryan Hynes, William Klinke Sr., Kenneth McConnell Sr., Frank McCourt, Edmund Miller Sr., Reginald Miller, Thomas Moffett, Charles Mulligan, Steve Patcella, William Reinhardt, Lyod Rhoda, William Schork, Eugene Schultz, and Gordon Smith. Engine and Hose Co. #3 is assigned to the headquarters at 97 Carleton Ave. and has been responding out of the Central Islip Fire Department headquarters since 1937. Currently Engine and Hose Company Three still has a full roster of 25 men and over 10 Senior Active members. 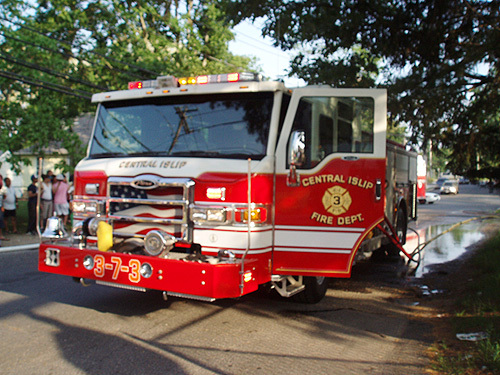 Always having a fully staffed company and a large amount of Senior Active members is a tribute to the dedication and commitment of the members to the Central Islip Fire Department and the community of Central Islip.